I could write about the impending disasters in the Middle East, the despicable nature of politics generally, or the Super Bowl. I could write about my utter despair at my dear aunt’s recent and precipitous medical decline or the crazy, sad moments at Sunday night dinner. But no, let’s go for the total self-indulgent. I have gray hair. Lots of it. I have worn each hair as a badge of honor and spoils of battles well fought (but mostly lost). The ones in the front are courtesy of POB (partner of blogger). The ones on either side of my head are gifts from SOS (our son, source of sanity). The top gray, well, those are genetic. Still, the salt and pepper is getting too salty. I am ok with this. Well, I WAS ok with this until I thought about the wedding. SOS wants to walk the two of us down the aisle. POB is blond (and even the color that lurks beneath is not gray yet). So, I had this picture in my mind’s eye of a young man, SOS, walking POB and this other person who looked his grandmother down the aisle. 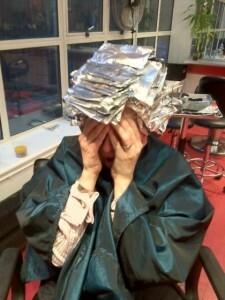 I ran to the hairdresser for some “hair painting”. POB and our hair dresser said it would only be a few strands here and there. “Low lights,” they said. Ok, I thought, having NO idea what that meant. Sidebar: A personal note to SNOBFOB (slightly neurotic obsessive about being identified as an FOB). SNOBFOB, I am sorry. Together, we pledged our allegiance to graying naturally. But yours is beautiful and textured and I am getting married. I understand that this is self-inflicted public humiliation. But when one is so self-righteous (as I was) about not fighting back the gray, I deserve a little humiliation. You can see the utter despair in my body language. I woke a sleeping Bridezilla and as a result, I need to knock her down with sedation. This entry was posted in Aging, Life, wedding and tagged Aging, bridezilla, bridezombie, wedding by 40andover. Bookmark the permalink.